Yaounde based Hip Hop crew , DOUBL-DRYM shall be releasing their new album on Saturday, 9th of July 2011 at Planetta , Carrefour Obili from 6 pm prompt. Guest Artists are Achalle, Richard Kings, Letis Diva, Adah, Dogstar,Don Frank, Lady B, Natty Bling and many more…. 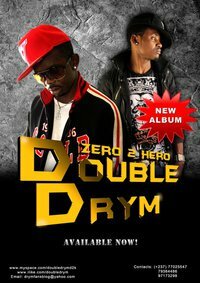 Doubl-Drym is a Yaounde-based Hip Hop duo comprising Lyl’ Kenzy and Young Kryz. They developed penchant for music and dancing during their secondary school days. Young Kryz played the guitar and gained acclamation among his peers often referred to as ”man na star” while Lyl’ Kenzy played the piano and laid much emphasis on singing, rapping and composing influenced by American Hip Hop rhythms. Kenzy and Kryz started performing separately in Secondary school until they graduated. Kenzy later joined rap groups like the G-Squad and the Vision Entertainment. During one Ex-Seminarians meeting, a remark was made about Lyl’ Ken-zy who was believed to be an amazing singer and rapper. Young Kryz hooked up with him and together formed the group , Doubl-Drym as they had the same dreams. Their major influence is Michael Jackson. They released their first album ” Zero 2 Hero” and a 6 tracks video CD this year .